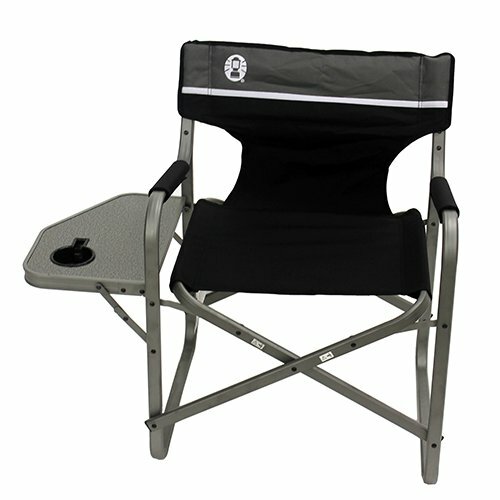 Take the comfort with you to the campsite, BBQ or picnic when you pack a Coleman Portable Deck Chair with Table. Relax with a drink and a snack on the side tray all afternoon with padded arm rests and an aluminum frame that supports up to 225 lbs. When the fun is done, easily fold up the lightweight chair, and take it to the car with one hand using the convenient carry handles. - Unfolded Dimensions: 34" x 20.9" x 31.1"
- Folded Dimensions: 31.1" x 22" x 6.1"
- Carry Weight: 7.7 lbs.